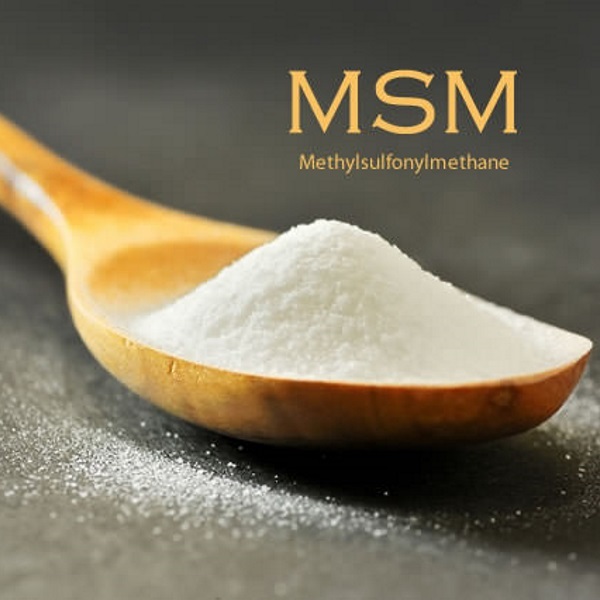 MSM, full name methylsulfonylmethane, may be an interesting supplement for strength athletes. Sports scientist Douglas Kalman of the University of Memphis comes to this cautious conclusion after doing a small human study. According to the study, which was published in the Journal of the International Society of Sports Nutrition, it seems that a daily dose of 3 g MSM speeds up post-weight training recovery. Everyday foods such as milk, fruit, coffee and tea provide us with small amounts of MSM. Studies have shown that this compound inhibits inflammation. MSM is believed to boost the production of the detoxifier glutathione, and to disrupt the nuclear factor kappa-beta. This is a transcription factor involved in the reaction of cells to nearly all kinds of stress – from UV radiation to LDL cholesterol, and from cancer to blood poisoning. Intensive strength training stresses muscle cells and results in inflammation. The quicker the inflammation disappears, the faster the muscles recover. And you can guess what direction the researchers’ thinking took: whether MSM supplementation might help speed up muscle recovery. The study was sponsored by TandemRain Innovations, George Bergstrom’s company. Bergstrom is also the driving force behind Bergstrom Nutrition [bergstromnutrition.com], the producer of the MSM preparation OptiMSM. This is the MSM that the researchers gave to their eight male subjects. The researchers divided their subjects into two groups. One group were given a daily dose of 1.5 g MSM for 28 days; the other group were given 3 g MSM. Before and after the supplementation period the men trained their quadriceps by doing 18 sets on the leg extension machine. Before, and then 2 and 48 hours after the training sessions, the researchers assessed the amount of muscle pain the subjects had and how tired they were. The figures below suggest that the 3 g dose of MSM certainly speeded up recovery. MSM supplementation did not raise the amount of glutathione in the blood. It did raise the antioxidant activity in the blood two hours after the workout. It’s not the first time that researchers have come across the protective effects of MSM on physical exertion. Researchers at the Islamic Azad University in Iran reported a few years ago that a 10-day supplementation period using 50 mg MSM per kg bodyweight reduced muscle damage after untrained men did endurance workouts. [J Pharm Pharmacol. 2011 Oct; 63(10): 1290-4.] [J Sports Med Phys Fitness. 2012 Apr; 52(2): 170-4.] In the Iranian studies MSM also boosted post-session antioxidant activity. J Int Soc Sports Nutr. 2012 Sep 27; 9(1): 46.